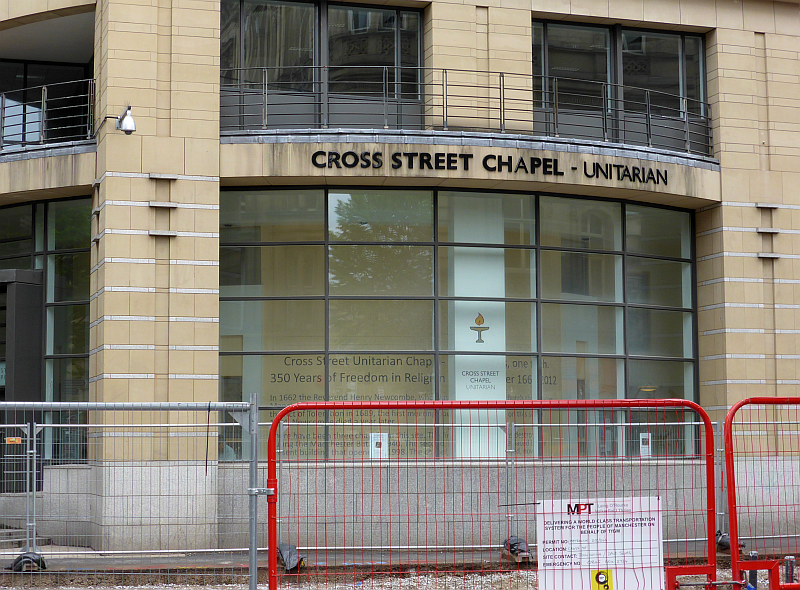 On Saturday May 21st I went to Cross Street Unitarian Chapel in Manchester for the Unitarian Theology Conference. I only decided to go just before the Rev. Ralph Catts, Hull minister, went on his holiday. I'd already said no to going to the General Assembly. This attracted me, but I was wary. I thought it could be largely a conservative event to be prescriptive in some impossible attempt to revive theology in Unitarianism. I'd already engaged in debates on the open to the public UK Unitarian Facebook page, suggesting that theological resources all around are quite diverse whereas this Unitarian conference would be all about identity, and a rather closed (Yale) postliberal view at that (to look, recognisably, like a Church, to have supporting theology). I learnt that Manchester had selected free city centre buses these days, and one stopped over 200 yards from the chapel. It seems I did after all get off at the nearest stop, but walked down the wrong connecting street. I arrived five minutes late and overheated. Nevertheless, I started making notes from the off, and wanted to make a positive contribution. And it was a lot better than I had expected. Stephen Lingwood did admit to being somewhat (Yale) postliberal in his stance regarding Unitarianism, but his proposal on the immediacy and unfolding of the Spirit seemed reasonable enough to me. The critique of it was better still, in that it employed many tools and indeed did ask why be attracted on the way by systematic theology? Really Melanie Prideaux should have critiqued every paper. Jo James produced a well argued selective history of the immediacy of the Spirit in radical egalitarian groups from the left wing of the Reformation and proposed the relevance of the Spirit today - it can unite where various positions among Unitarian pluralism put people off. Trouble is, the Spirit doesn't help, of itself, co-ordinated organisation. David Steers' paper was not so much towards the twenty-first century as to go back to back to the nineteenth. 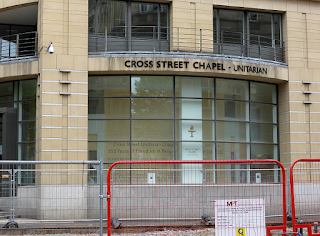 It was narrow in sympathy and lamented a denomination going somewhere he'd rather not: but if the UUA isn't relevant for British Unitarianism then certainly religion from Northern Ireland isn't. And hopefully that religious culture will be changing as confidence grows about a more modern less clerical Ireland, and non-subscribers won't be able to ride its back for so long. I tackled David Steers' paper first, because I thought it would have been first. I realise it probably would have been last anyway. So rather than everything improving afterwards, it might have left a bad taste in the mouth. Why was it the 'keynote speech' when Jo James's talk was far more intellectually robust and useful? Hopefully, this is the first of many such conferences. This was conservative biased, but that was bound to be the case. There is suspicion about theology in Unitarianism: that it is still Christian, that it tries to say one thing and mean another as in the so-called mainstream. Theology can come from below, and that was said enough to provide at least the prospect of alternatives. A key idea emerging from the Conference was Unitarians restoring a chain of memory, to discover, theologically, how they got from there (e.g. Martineau and Adams) to here (pluralism - classifying the positions, classifying the subjective turn in spirituality or the postmodernity of positions). It's worth the effort. These lectures and sound files I've also done are on the Pluralist Website, in the Learning Area, the Religion section, and the ever-expanding Unitarianism part. A recent addition there, on the Unitarian 'Harmless Freedom' alternative history ties in very well with Jo James's presentation. The BBC News has become tedious; it is biased in its emphasis on Labour's weakness, and seems not to realise there is yet another reason why Conservative weakness should lead to an early General Election. I know that it is a feature of the blog world to run conspiracy theory including the reporting of BBC journalists, linking the BBC reporting to a corrupted BBC Trust and government connections. I don't know about that, but there does seem to be something profoundly obsessional about Laura Kuenssberg and her reporting, among others. The weight of the focus is on Labour and its inadequacies after the local elections. Meanwhile there is next to nothing on the 27 MPs where there is apparent evidence of overspending so that we are having policies inflicted upon us by a corrupt government. Channel 4 News has made this story, but with police forces taking up investigation it should now have made BBC News. Nor has the BBC News criticised the timing of the government's about face regarding compulsion and school academies. Now I'm not saying that the BBC News is like Russia Today. Russia Today is corrupted journalism. It puts out opinions as news and lurks in its own conspiracy theories as a way of slinging mud in various directions. Its journalists have sold out - there might be little option of course for them. In fact the channel is misnamed, because it rarely features Russian news at all, but goes on and on about the United States and less so the United Kingdom. When it features direct Russian policy, e.g. towards Turkey, it shows its bias without shadows and interferences, but on other subjects it seeks to undermine by speculation. Only occasionally does it feature an insight clearly missing from BBC News and Sky News etc..
Rather, BBC News is timid, and frightened of a government that has salami-sliced the licence fee and cut its budget heavily, and fears worse. Imagine if Channel 4, in fear of privatisation, had told Channel 4 News to go easy on the corruption story regarding Conservative Party election expenses. Meanwhile, in order to be investigative, BBC News weighs-in to Labour, if it analyses the Tories with any intensity at all. The Labour Party has more than a problem in Scotland, of course. But the analysis is that devolution has so cut the direct link so that the Tories can now redefine and recover north of the border. It is precisely the distance from Cameron and Osborne that has allowed its redefinition as a broader yet Unionist party. The Conservatives chose one side of the faultline in Scottish politics, to anti the SNP, and has replaced Labour that was tainted with a Unionism and a London semi-Toryism before further devolved powers happened. This faultline does not exist in Wales, where Labour held on far better than might have been expected, especially with UKIP picking up disgruntled and simplistic ex-Labour voters, the old Tory working class voter that blames others for things that have gone wrong. Labour also held up well enough in areas where it would have been expected to have been in meltdown. And in London Labour showed what a positive multi-ethnic campaign can do, compared with a horrible Tory campaign. Sadiq Khan is regarded as a politician of strategy and integrity. What is missing in the BBC analysis is that Jeremy Corbyn is a slow burn as he maintains his integrity. This integrity is attractive and, whatever doubts one might have about him as a politician who can wield a knife, a decisiveness sometimes necessary in decision making, the man has this attractive integrity. He says what he thinks, and he actually stands for a radical alternative. He is contrasted with Cameron the PR man, who fakes his interviews to then 'rush off' oh so decisively, who fakes his performances in speeches and visits, and has back of a postcard policies regularly sent off into U-turns (thank goodness) and who, one thinks, believes in one thing - privilege and himself and his pals near and far. Where in the BBC is there an analysis of the wealth economy, for example, and how it works. Paul Mason told us, once he arrived at Channel 4 News temporarily. He did actually explain Corbyn's alternative. Now I, along with many, maintain that the European Union in-Out Referendum is entirely about the Conservative Party and the electorate making a decision that the Conservative Party cannot (rather than a policy that is so deep and changable from the present that it needs a popular vote beyond the role of our representatives). The government wants us to stay in Europe, but to solve its party's angst wants a popular vote to confirm what continues. Except, if the BBC was doing analysis properly, it would discuss the weakness of Cameron (and Osborne) whatever happens. If the vote is to exit, Cameron must resign and take his Chancellor with him. But if Cameron wins, his party will cry foul, and will become wreckless. The BBC seems to take the lead from the agenda set in an increasingly unimportant national press or government announcements. We know why Sky News does this, but BBC News ought to make its own decisions. If the BBC cannot analyse then it ought to adopt the stance of C-Span in the USA, which is that of utter neutrality plus some history and let voices speak for themselves. I have predicted an early General Election because of this European dimension, but I also predict one now because of the electoral corruption. One way to overcome 27 potential by-elections and punishment by the electorate for cheating is to call a General Election. No doubt the BBC will continue to focus on Labour and its weakness. Don't be so sure. The coming General Election will be a sign of the Tories' weakness, both as a result of the referendum and as a result of allegations of corruption. I did actually order this, in a free service online and wasn't sent it or notified. But I went searching yesterday, and found it. It's my very own Ph.D thesis. I was never able to keep it because it was created and edited on an Amstrad PCW 8256 and the reading of the 3" disks went funny. I was unable to transfer the content on to a second disk below, size of 3.5" floppy disk, as became standard. Through the post (in those days) I obtained software to change the CP/M of any disk to DOS, to contain unformatted text files, and thus transfer content unformatted to my new PC computer running Windows 95. It wasn't long before Windows 98 appeared, but was a very long time before I used Windows 98 (and that was on a second PC computer when I had Windows XP! I jumped from 95 to XP via a new computer construction and purchase). All the time my website had the MA dissertation, as I did that on MS Word via Windows 95, but only summary and derived material relating to the Ph.D. I also lost a novel on these 3" disks. I never found a temporary or any PCW or any service by which to claw back this material. But now someone else has done it. All I can say for these hybrid Optical Character Reader (OCR) scans into a .PDF is that they allow the user to extract the real text and correct it against the image of the text. My Ph.D image shows the Locoscript font and dot matrix output. Back then I wanted to print it out myself, despite the slow printer and danger I might knacker it for page after page. I was advised before the operation that it was only just acceptable - I wanted to avoid printing it in bold. I did avoid this. It did need new ribbons however and many of them. The given tendency to overuse a ribbon was not an option. Once it had gone round once that was it - replace and the next one. I remember the disappointment of all that effort and discovering mistakes, and my tutor just saying it's OK enough and correcting by hand. I tried for replacement pages in my copy, but this scan shows the crossing out and of course the OCR can't handle the handwritten replacement. Anyway, here is the thesis.PDF and it is a wopping 15 mb because of all the page images. Of course I am working on a text version, with so many corrections to make. My usual method is to make a webpage of it all - very long! - and indicate where the page breaks were in the original for people wanting to use it. My view is it is open for others' uses. Now a John Seed years earlier wrote a Ph.D thesis on the social structure and middle class culture of Unitarianism. Completed in 1981, the fact is that it contains material I have not seen before (as well as some I have). The link I give to it is where I found it, but I have produced extracts relevant to Hull on a webpage and that is where the link is found. I note that this Ph.D was typed, and had some inserts for missing Part 1 and Part 2 titles. The text scan underlying it isn't too bad but far from mistake free. With these updates I have taken the opportunity to remove the Learning Area Sociology of Religion menu links to Social Science only, and my own academic work with Ph.D is more accessible now. In Social Sciences my academic work used to jump (and still can) to an explanatory page for a list of items. This was an inheritance from the website in its earlier days. Now the Religion area is more purely Religious Education and its subsets, including Theology and the Social Sciences section has a more immediate menu of this material. I am aware that some items can appear in several sections. Local religious history could appear in Religion, History and Localities. There are some multiple menu links but mostly I try to keep with one. Nevertheless some rewritten Leonard Chamberlain material is in the Localities Area because it is about places where he functioned and where his legacy continues. A rewritten piece on the Charity of Chamberlain is in the Localities Area. History I want as much about issues of doing history as well as about history.